Uneven flooring or items blocking the walkway, like files or boxes, can cause employees to trip and fall. Computer cables and power cords are also common trip and fall risks within an office setting. Serious falls often lead to broken or fractured bones. Bumping into items. File cabinet and desk drawers can turn into dangerous weapons when left open and unattended. An unexpecting employee may walk into an open cabinet door or hit their head after bending over to pick up an item. A serious bump to the head can even cause a traumatic brain injury. Lifting or reaching strains. Office workers often engage in activities that require them to reach for objects that are located high above their heads or pick up heavy items from the floor. 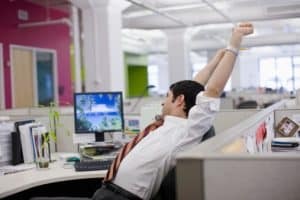 These movements and actions can cause severe muscle strains to the employee. Improper lifting can severely injure the employee’s neck or back. Some victims may not have the ability to fully recover from these conditions. Broken furniture. When office furniture is not properly maintained, it can become dangerous to workers and visitors. A broken chair can collapse when sat on, causing an individual to fall onto the hard floor. Old desks and tables can also become unstable, especially when they are piled high with office equipment and files. Workplace violence. Though rare, acts of violence within the workplace do occur. When co-workers commit acts of violence within the office, it can cause serious physical and psychological injuries. Under some circumstances, employers may have a duty to put measures in place to prevent such tragic occurrences. Busy office workers may rush through the hallways in a hurry to meet a deadline of completing a task. When these workers fail to move with care and attention to their surroundings, they may collide into one another, causing substantial injury. Falling objects. Storage and filing are common challenges within an office environment. Companies are constantly searching for places to put more files, office supplies, and other materials that are not needed on a daily basis. Unfortunately, many office managers choose to stack these items on top of tall bookshelves and filing cabinets. Improper storage can create a serious hazard for falling objects. Even paper files can become dangerous when an entire stack of them falls onto an unsuspecting office worker’s head. When a day at the office results in serious injuries, the knowledgeable Los Angeles personal injury attorneys of Taylor & Ring have the skill to hold all responsible parties accountable for your harm. Call our Southern California office at 310-776-6390. You can also schedule a free consultation about your injuries by filling out this contact form.